How To Locate 5 Digits Keyless Entry Pad Code On Lincoln MKS – The Lincoln MKS is a mid-range model of the Lincoln brand belonging to the Ford Motor Company and was produced between 2008 and 2016. Like some Volvo models, the MKS also built on the Ford D3 platform. The role of the largest model in the Lincoln model range was taken over by the Lincoln Continental (2016), which has been available since November 2016 and will be available from the beginning of 2017. At the LA Auto Show in late 2011, the second generation of the MKS was presented. At the front, the headlights were scaled down and the interior of the same was restructured. The grill now consisted of several, finely worked out chrome struts. In addition, the mounts of the fog lights were much smaller. At the rear, the lights were revised, so that they now partially worked with LED technology. Have you lost your factory door code for your Lincoln car? This guide shows you how to find the Factory preset Lincoln MKS (2009 2010 2011 2012 2013 2014 2015 2016 model years) Securicode Keyless Entry Door Keypad Code. The first thing to get Keyless Entry Door Factory Code you need to locate the Smart Junction Box (SJB). 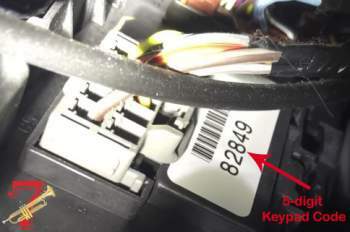 On the 2009-2018 Lincoln MKS, the Smart Junction Box (SJB) is located under the instrument panel to the left of the steering wheel. You will need to remove the trim panel for access to the SJB box. Securicode Keyless Entry Door Keypad Code located on a black & white sticker attached to the Smart Junction Box SJB, it is 5-digit followed by a letter. This procedure should work for the latest generation of the Lincoln MKS (2009 2010 2011 2012 2013 2014 2015 2016 model years). Hopefully, the article on How To Locate 5 Digits Keyless Entry Pad Code On Lincoln MKS useful for you. Good Luck! How do I reset the TC Electronic G-System?